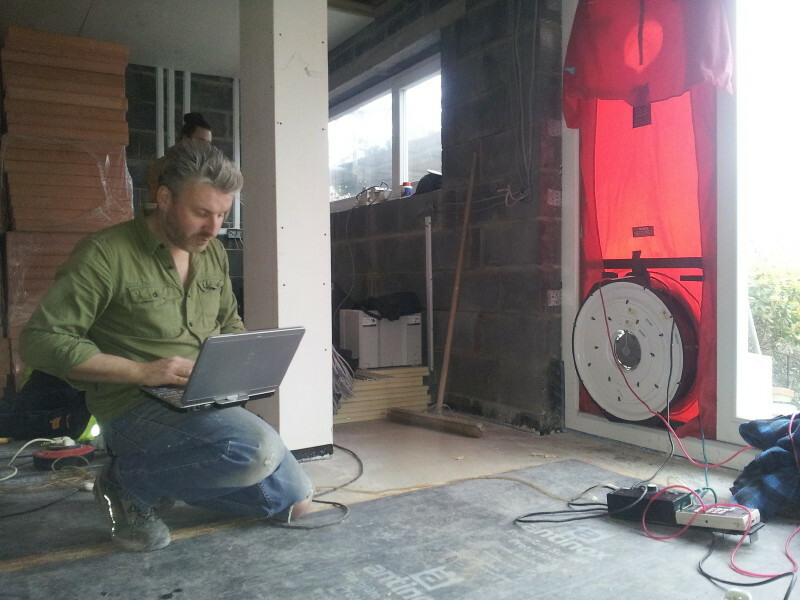 I carried out the first air leakage pre-test this week. Our target for the extension area is 1.5 m³.h/m². 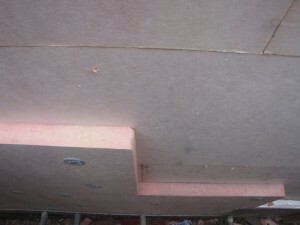 The primary air barrier on this project is on the outside of the masonry, i.e. 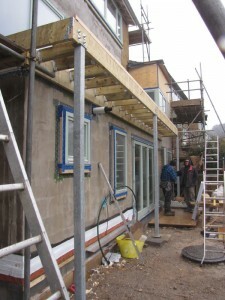 just behind the external wall insulation, which will be applied shortly. So, we decide to do an initial test to see if there are underlying issues prior to covering everything up. 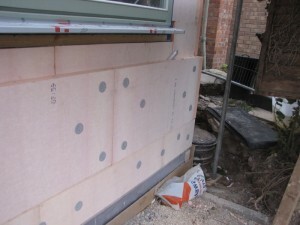 The base render coat acts as the main air barrier, so anything coming through this must be sealed. 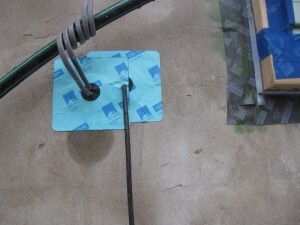 Cables and the boiler flue are provided with grommets, providing a good seal around these penetrations. The windows have been sealed with tape (see earlier post) around the outside, but the internal sealing hasn’t been done yet. 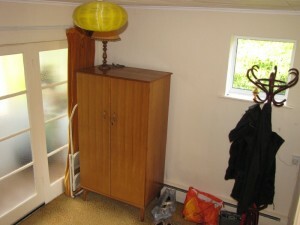 So to the result… we get a pretty good 2.7 m³.h/m². Leakage detection identifies a significant amount of leakage around the internal openings to the existing house, which were temporarily sealed, so this needs improvement prior to the next test. There is a small amount of leakage around the windows, due mostly to the incompleteness of the inner seal, and a little through the drains (not filled with water yet). 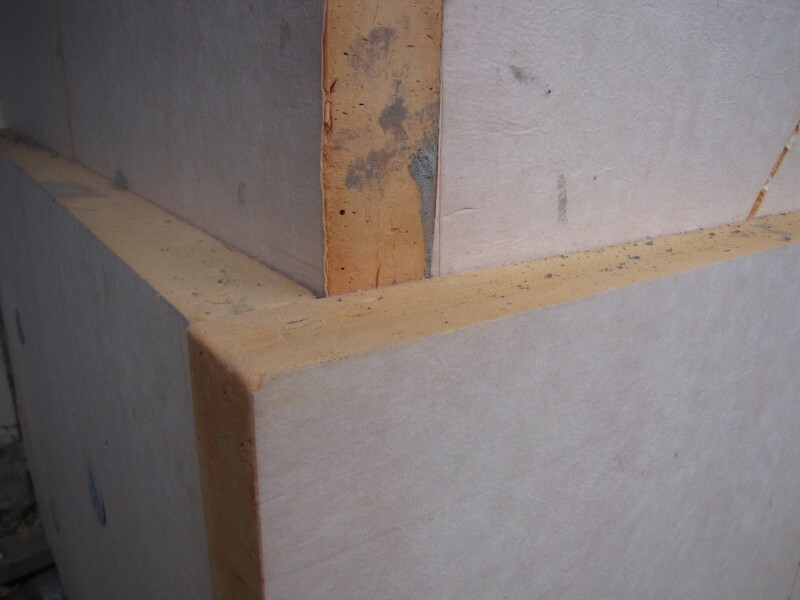 Also, our secondary air barrier, internal plaster, hasn’t been done yet. But all in all this isn’t bad, and believe we’re on track for meeting our target of 1.5 m³.h/m². 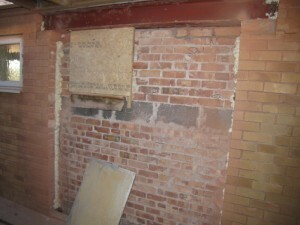 The internals are now starting to transform the space from being a building site. 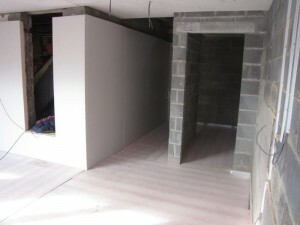 The extension area at both the lower ground level and ground level is now being boarded out. The ceiling boarding is magnesium silicate by Multi-Pro. 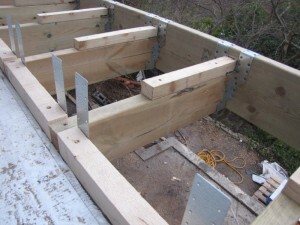 This is a moisture resistant board and has a greater breath-ability than plasterboard. 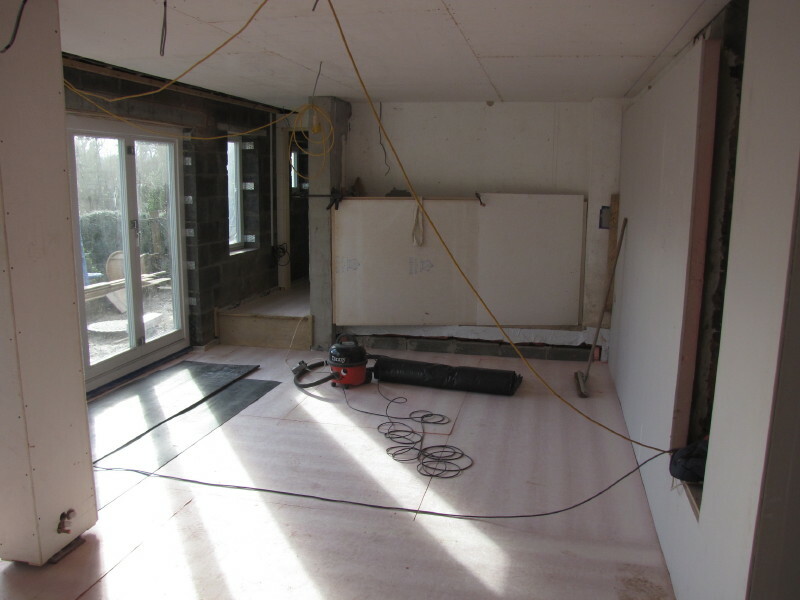 The external walls will be plastered, but we have used 62.5mm Kingspan K17 insulated plasterboard on the internal walls (external prior to extension) that have been underpinned. 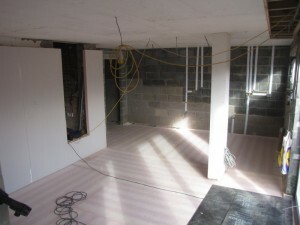 The floor insulation has also been laid. 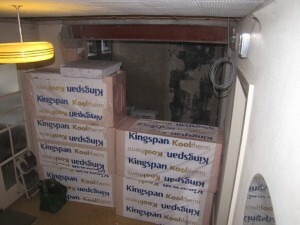 Again, we have used Kingspan K3 floorboard. This is 100mm thick, and achieves a U-value of 0.13 W/m².K. 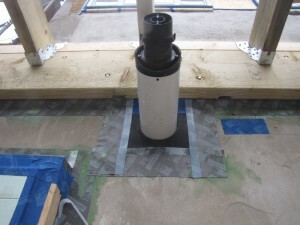 The insulation is laid directly onto the sub slab and covered with polythene ready for the screed. 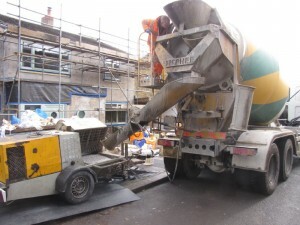 The screed arrived today on a mixer lorry. 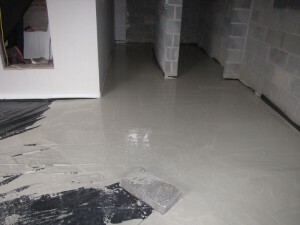 We are using a liquid flow screed, which allows a thinner layer (30mm) compared to traditional sand/cement screed (65mm). I’ve not used this type before, so will be interested to see how successful it is.